Work begins soon on a project to transform a historic elementary school in Swissvale into 18 condominiums. The re-use of the Deniston School will answer a need for high-quality, affordable housing in the east suburbs of Pittsburgh, says Laura R. Zinski, chief executive officer of Mon Valley Initiative, which is leading the effort. “The Deniston School is a unique opportunity to preserve a wonderful landmark building, and also to provide solid homes and investments to a wide range of families,” Zinski says. Built in 1902 and placed on the National Register of Historic Places in 1984, the school at the corner of McClure Avenue and Monroe Street was converted into apartments in the early 1980s, but fell into disrepair. In 2012, the last tenants were evicted and the building has been vacant since then. 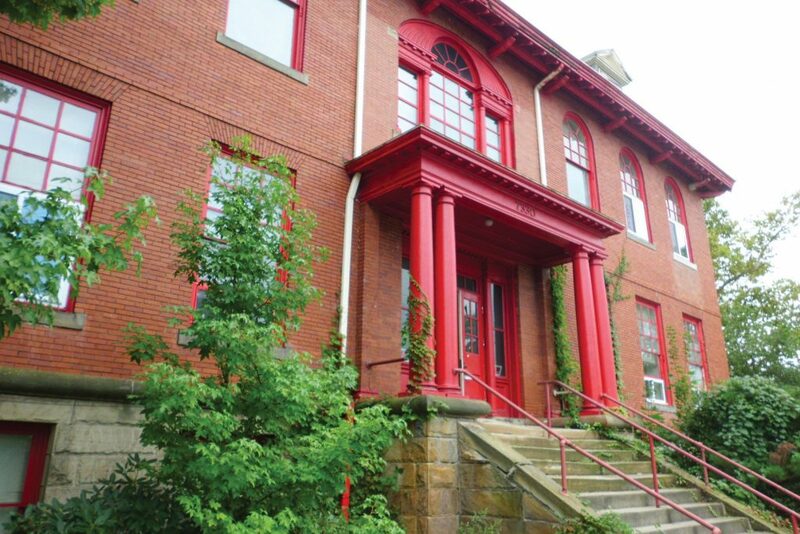 With the help of Swissvale Economic Development Corp. and borough officials, Mon Valley Initiative, a non-profit regional community development agency, purchased the building in 2016 using Allegheny County’s Vacant Property Recovery Program. The condominiums are being designed by LGA Partners, an architecture firm in the uptown section of Pittsburgh, says Patrick Shattuck, real estate director for Mon Valley Initiative. General contractor on the project is DRS of Greater Pittsburgh. There will be 15 two-bedroom units, two three-bedroom units and a single one-bedroom unit, Shattuck says. Exact sale prices are yet to be determined, but they will be competitive with other condo units in the east suburbs, Shattuck says. Each unit will have its own laundry and the ground floor units will be wheelchair accessible, he says. There will be off-street parking for more than 20 cars. “It’s a really beautiful building, and although there have been a lot of changes to the interior over the years, we are trying to preserve as many of the school’s features as possible,” Shattuck says. Eight dormers on the roof will be opened up to create large, spacious living areas in the units on the top level, he says, and the original windows are being refurbished, wherever possible. Construction is expected to be complete in late 2018, Shattuck says. Financing for the project is being provided in part by the Allegheny County Residential Finance Authority and the U.S. Department of Housing and Urban Development’s Community Development Block Grant program, administered by the Allegheny County Department of Economic Development. The Deniston School is MVI’s second condominium project in Swissvale. In 2011, MVI converted the former Madonna del Castello Church on Duquesne Avenue into condominiums. That project, like Deniston School, was designed by LGA, formerly known as Lami Grubb Architects. Over the past decade, MVI has rehabilitated 33 different residential properties in Swissvale with a total fair market value of more than $3.5 million. Founded in 1988, MVI provides real estate and community development, housing counseling services and workforce and business development in parts of Allegheny, Westmoreland and Washington counties.